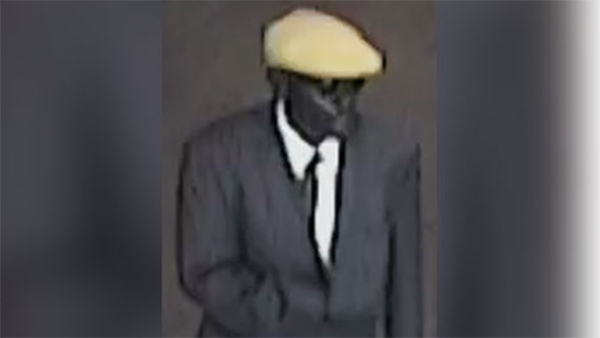 PHILADELPHIA (WPVI) -- Police are looking for a man who allegedly robbed two banks within one hour on Tuesday while dressed in a suit and tie. The first robbery occurred at 3:17 p.m. at the Philadelphia Federal Credit union at 5000 Baltimore Avenue. The man threatened a teller, police say, claiming he had a bomb and a gun. He demanded, and received, an undisclosed amount of cash and fled. Police say he may have gotten into an older model gray four-door Chevrolet. Then, at 3:53 p.m., police say the same man entered the Prudential Savings Bank at 1722 South Broad Street. He claimed to have a bomb, the demanded and received an undisclosed amount of cash. He then fled the bank on foot. Police say no weapons were seen in either incident. The subject is described as a black male in his 50's, approximately 6 feet tall with a medium build, dark complexion, and missing his lower front teeth. He was wearing a dark brown pinstriped suit, white collared dress shirt, black tie, dark-colored dress shoes, round sunglasses, and a tan flat cap. Anyone with information about these robberies or this subject is urged to call the FBI/PPD Violent Crimes Task Force at 215-418-4000. Police say there is a reward for information leading to suspect's arrest and tipsters can remain anonymous.